Despite the snow, we didn’t get a chance to have any other posts this week other than the Monday Mystery fossil. We did, however, have three different school trips in the past couple of weeks to talk to kids about fossils, dinosaurs, and the skeletal system, as well as giving talks on the fossils telling us about the origins of crocodiles and dinosaurs, as well as attending a talk on the origins of birds. So a lot of paleo work, just not much showing up here. Fortunately, some of you had some time to examine our mystery fossil and congratulations to Laurenwritesscience for coming up with the correct answer. 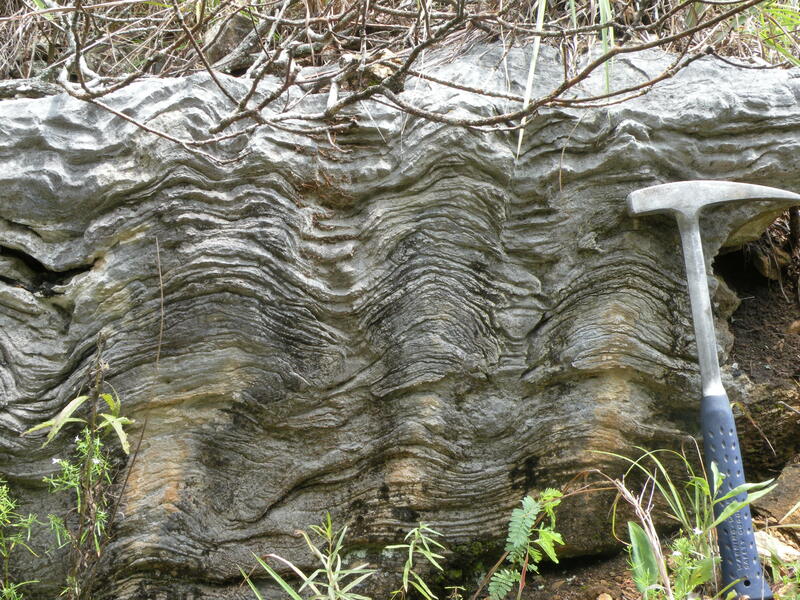 It is indeed a stromatolite. Bruce Stinchcomb has a video on Youtube showing several examples of Ozark stromatolites and providing a good explanation of what they are. 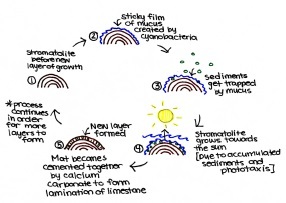 Essentially, stromatolites are microbial ecosystems, built up of layer after layer of microbial mats. The general description is that of blue-green algae, which forms a sticky layer over the surface of a rocky surface in a shallow marine or coastal environment. Blue-green algae are not actually algae and are better referred to as cyanobacteria. These bacteria are photosynthetic, just like plants, so they need sunlight, thus limiting the depth at which they can be found. Actually, they are typically found right at the water’s edge in the tidal zone. This sticky substance, while maintaining their hold on the rock, also tends to collect sand, clay, and organic debris. Over time, all the stuff that sticks to the mat blocks the sunlight from the cyanobacteria and they migrate above the layer and build another mat, which collects more debris, which causes them to build another mat, etc. Stromatolites form much the same way as piles of laundry. By the time you finish washing one set, there is another pile forming in a neverending stream. The life of a cyanobacteria in a stromatolite is a depressing condition of always digging themselves out from under a pile just to get dumped on again. I am sure most people can empathize. The sticky mucus (properly referred to as extrapolymeric substance, or EPS for short, but we can go with mucus here) forming the mat does more than just cause things to stick to it. The mat protects the bacteria in from ultraviolet radiation. It also allows the bacteria to control the microenvironment around them, keeping such things as pH levels in a good range. It also has an unfortunate aspect for the bacteria. The mucus allows the levels of calcium and carbonate ions to build up until they precipitate out of the water as calcium carbonate, also known as calcite (when referring to the mineral), or limestone (when referring to the rock). So not only are the poor bacteria constantly getting buried, they are getting turned to stone in their very own medusa nightmare. Life is hard as a cyanobacteria. But just wait, it gets worse. These microbial mats are not just cyanobacteria, though. There are lots of other organisms that live in and on them. There are many other types of bacteria. There are sulfate reducing bacteria, which use sulfur like we use oxygen, only they release hydrogen sulfide instead of carbon dioxide, causing a nice rotten egg smell. 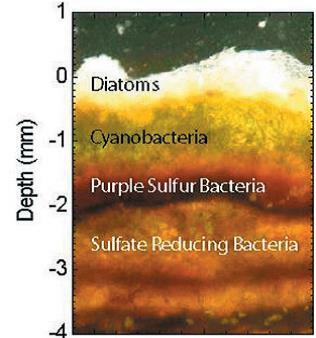 There are purple sulfur bacteria that eat the hydrogen sulfide, as well as colorless sulfur bacteria that eat both the hydrogen sulfide and the oxygen released by the cyanobacteria, thus free-loading off of everyone. In addition to bacteria, there are plenty of prokaryotes (organisms without nuclei that holds their DNA) and eukaryotic (with nuclei) single-celled and multi-celled organisms living in the mat. Diatoms, single-celled photosynthetic organisms that grow their own shell, live on top, while nematodes burrow through the mat. In addition to all this, a wide variety of animals love to chow down on the mats. Everything from snails, sea urchins, crabs, crawfish, and just regular old fish happily eat them. 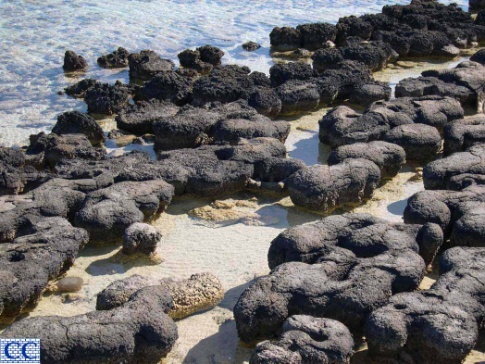 As a result, there are not a lot of places left in the world you can find stromatolites growing. The Bahamas and Shark’s Bay, Australia are the best areas to find them. They may be rare now, but at one time, they ruled the earth. As some of the oldest living communities in the world, they have been around for at least 3.5 billion years (that’s 3,500,000,000, or roughly 600,000 times the length of human civilization) and for more 2/3 of that time, they were the only game in town and in all probability served as the cradle for all eukaryotic and multi-cellular organism on the planet. These days, if you live in Arkansas, the only places you can find them are as fossils in the Cambrian age Cotter Formation and Ordovician age Everton Formation in the Ozark Plateau. For further information (and the source of the images shown here), check out the stromatolite page at the Arkansas Geological Survey and the Microbe Wiki stromatolite page, as well as the Microbes.arc.nasa.gov site, which supplies a nice teacher’s guide to teaching all about microbial mats, designed for grades 5-8. By paleoaerie in Fossils of Arkansas, Paleontology, Uncategorized on March 7, 2014 .